We have had the luxury of taking our time a little bit on our journey through Nicaragua, this coupled with smooth roads and relatively flat terrain, has allowed us to use some of our other muscles. We found that our hammock sitting and smoothie drinking muscles were shockingly weak, so first we spent some time strengthening these in the town of Granada. Then we got restless and went hiking and kayaking and exploring....in between the biking :). Nicaragua is a pretty magical place, with giant lakes and giant volcanoes in every direction you look. It has been a pretty great country to cycle through, although it is hot, the roads are good and the hills are dwarf like compared to some of our other mountain riding. It is hot down here at sea level... And I'm sure that all of you devoted readers have figured out that I (ali) find riding in the heat almost as enjoyable as dining on fish heads...Glenn on the other hand is loving the hot weather, I'm not quite sure what is wrong with him. But, he does not like how grumpy I get when I get too hot. So, we have reverted back to our very early starts. The sun rises at about 5:45 he, which means getting out of bed at 4:30 am , stumbling around for a little while, making coffee and food, packing up, and getting on the bikes as early as we can. Our ride out of Leon was straight and flat, but as the morning drew on, the wind got strong, and it was unfortunately not in our favour. Progress slowed, but we crept closer to Lake Managua and started to feel some cooler air coming off of it...sweet relief. Our intention was to camp in a nature reserve about half way between Leon and Granada, or stay in a nearby town. However, when we got there, folks told us that the reserve would not be safe to camp at overnight and there were no hotels or guesthouses nearby. So we carried on moving closer and closer to the Nicaraguan capital of Managua. It was getting late, but we were told that there was a hotel a little ways ahead...and indeed there was. It was an Auto Hotel, these are somewhat of an institution here in Latin America (so far anyways). They are hourly rate hotels catering to those needing a quick love fix, and the specialize in discreetness. They almost always have a parking area in front of the room with a vinyl curtain to cover your car.... just incase someone you know drives by. It took some time to negotiate a price, and to explain that we wanted to stay for the full night. The room was equipped with posters, viewing materials, and music to set the mood, and the mattress and pillows had vinyl covers... Easy clean up, I guess? You could even call to order room service and it would be delivered to you through a special cubby in the wall...discreetness. After our restful sleep at the love hotel (which was called 'bubbles of love'), we rode off towards Granada. We cut through the city of Managua, up and over a hill (only about 300 meters!) and descended into The lakeside town of Granada. We spent four very relaxing days in Granada, where we were fortunate enough to stay at our friends hostel that was closed for the holidays. So, we had a beautiful colonial home (complete with a pool!) to ourselves! Having a beautiful place to stay in Granada made it easy to decide to stay there a few days to rest up and explore the area. Granada is a beautiful town, incidentally it is the arch rival of Leon. Like Leon it is filled with Colonial buildings and some cobbly roads...also it has quite a number of restaurants and shops catering to tourists. We did most of our own cooking, and explored the free sites... But we did indulge in a kayak trip in the the small islands surrounding Granada... It was lovely to be on the water, and to use our arm muscles for a bit! We also took a long walk to the Apoyo Laguna, about five km out of town. It, like many Lagoons ithe area, is housed in a volcanic crater. The water was clear, clean, and is apparently stock full of minerals that will make us very healthy. Most people take a bus to an area on the other side of the Lagoon, where there are restaurants and such... So we were lucky to have walked, because we found an isolated edge of the Lagoon for some peaceful swimming. On December 24th it was finally time to leave Granada, the plan was to take the four hour ferry from Granada to Isla Ometepe on Lake Nicaragua. The ferry left at two in the afternoon, so the morning was spent lazing and organizing. We then made our way to the dock, noticing as we approached that no one seemed to be around...except a few guards. They told as that no ferries were running until the 27th, because of the holidays... it was pretty funny that on the first time in months that we attempted to take public transit...we mess it up! So it was back on the bikes, to San Jorge, some 75 km away, where the ferry ran every day. The ride was fast, with only one big hill at the start, but just the same we didn't make it to a hotel until just after dark and we would have to wait for the morning to ferry over to the island. 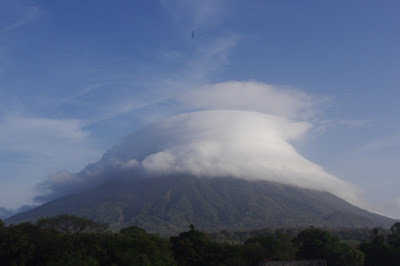 People have been recommending that we visit Isla Ometepe for some time now. At first we were a little worried that it would be too touristy, and unpleasant, but the more we read about the more we wanted to go. The island sits in the centre of Lake Nicaragua, which is the largest lake in Central America (and the 19th largest lake in the world). It is made up of two volcanos, one active and one declared extinct. It is a stunningly beautiful place, and yes there are tourists there, but it is not a gaudy kind of tourism that leaves a sick feeling in your stomach. On the contrary, the tourists come from all over Central America and further abroad to experience the beauty and magic that this place has to offer...and you get the feeling that the people who live on the island are pretty proud of it. We were fortunate to meet some other bicycle riders just before we got on the ferry. Damon and Mark have been travelling by van, but have two bikes strapped to the back of the van. This is because Damon had been cycling through Mexico and Guatemala. They decided to bring just the bikes to the island, and we had the pleasure of hanging out with them for a few days. It was really good to have some riding (and hiking!) companions - Not to mention some good bike trip talk! So far Costa Rica feels a little more organized, cleaner around the edges, and a lot more expensive than the other Central American countries we have peddaled thorough...it will certainly take a little getting used to!